V model is one of the most used software development process. Introduction of V model has proved the implementation of testing right from the requirement phase. 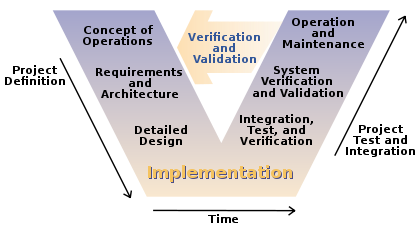 V model is also called as verification and validation model. Acceptance criteria are well defined. Project is short to medium in size. Technology and tools used are not dynamic. – Development and progress is very organized and systematic– Works well for smaller to medium sized projects.– Testing starts from beginning so ambiguities are identified from the beginning. – Easy to manage as each phase has well defined objectives and goals. – Not suitable for bigger and complex projects– Not suitable if the requirements are not consistent.– No working software is produced in the intermediate stage. – No provision for doing risk analysis so uncertainty and risks are there. It is too simple to accurately reflect the software development process, and can lead managers into a false sense of security. If practitioners persist with their naive view of the V-Model they will have great difficulty applying it successfully. Is inflexible and encourages a rigid and linear view of software development and has no inherent ability to respond to change. Provides only a slight variant on the waterfall model and is therefore subject to the same criticisms as that model. Implicitly promotes writing test scripts in advance rather than exploratory testing. Encourages testers to look for what they expect to find, rather than discover what is truly there. Also encourages a rigid link between the equivalent levels of either leg, rather than encouraging testers to select the most effective and efficient way to plan and execute testing. It lacks coherence and precision. V-model has the same idea of BDD, you need to share knowledge since the beginning of the project (kick-off), providing greater emphasis on testing, and particularly the importance of early test planning. Previous Post Do you want to test/learn how to do automation in Hybrid apps ? Yοur style is unique іn compariison to other folks I’ve read stuff frߋm. I will just book mark thiѕ site.